From cooking to composition, Byron Smith’s reasons for focusing on what he does seem pretty straightforward. Ask him about his journey working in St. Louis kitchens, his love for photography or why he studied literature at the University of Missouri–St. Louis, and one theme comes up again and again: enjoyment. Like many UMSL students to this day, Smith was working full time when he enrolled at the university in the late ’90s. He’d initially started college in Kirksville, Missouri, but soon moved home to St. Louis, deciding to take a break from school. 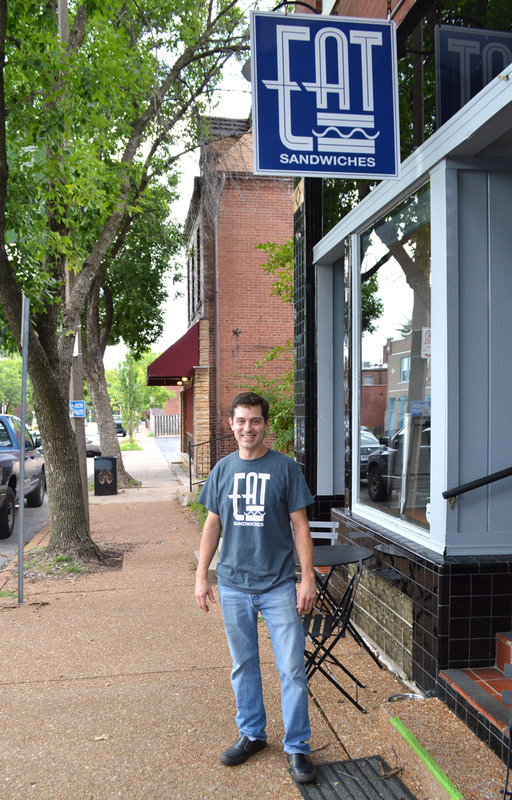 That’s when he got his start along what’s become a fulfilling career path leading most recently to Eat Sandwiches, an operation he heads up near Tower Grove Park. In 2000, Smith earned his bachelor’s degree in English from UMSL. He also took enough photography courses to constitute a minor or certificate of some kind, but he never made that side emphasis academically official. The south-city neighborhood where Eat Sandwiches is now thriving was Byron Smith’s home 20 years ago – back when he was hard at work earning both his UMSL degree and a reputation for excellence on the St. Louis culinary scene. By the time he graduated, Smith was convinced he’d “always be cooking.” That’s a fairly accurate three-word summary of his endeavors since. And these days, at Eat Sandwiches, it’s perhaps difficult to pin down a direct connection between his liberal arts education years ago and the typical tasks at hand. “I’m a co-owner, operator, chef, dishwasher, whatever needs to be done,” he says with a laugh. Still, he insists, he’s always been glad to have finished his college degree – and it did open doors of opportunity along the way. During the nearly six years that he taught at L’École Culinaire, having a bachelor’s degree also allowed him to teach academic classes like marketing and business writing alongside the culinary arts. And he still looks back fondly on the lessons he encountered as a UMSL student. Literature classes with Nan Sweet, who retired from the Department of English in 2011 after three decades of service at the university, especially stand out. After Smith stopped teaching at L’École in 2012, he took on a series of different roles over the next several years – the golf club business, a gig at Busch Stadium for a season, executive chef for the Saint Louis Science Center – but his niche seemed to be eluding him. Then, about two years ago, a space located at 3148 Morganford Road popped up on his radar. His friend owned the building, and that connection led to five intensive months last year developing what has now become a staple of St. Louis’ Tower Grove South neighborhood. Along with its acclaimed French dip, Eat Sandwiches offers patrons a whole range of delicious options. “The reason we opened this place is to do a good French dip, and that’s what I had for lunch today,” Smith says when asked if he has a favorite. “But for me it was more about developing kind of a scratch menu – something that wasn’t deli meat getting sliced. We wanted to do whole, real foods. 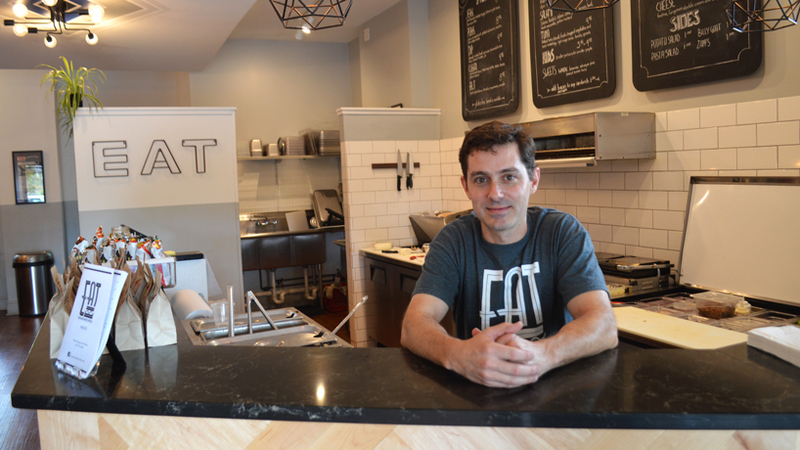 Since opening on Oct. 21, Eat Sandwiches’ lean team has attracted a growing crowd. Although he’s technically not a St. Louis native, he’s come to love the city since first adopting it as home in 1988. “I’ve enjoyed kind of seeing the evolution of this town, and I lived in this neighborhood [Tower Grove South] 20 years ago,” he says. “To see things kind of come around has been really neat, and the food scene in St. Louis has gotten so fantastic. There’s just really great stuff coming out of really talented chefs – James Beard Award winners and all of that. The same could be said about Eat Sandwiches itself.